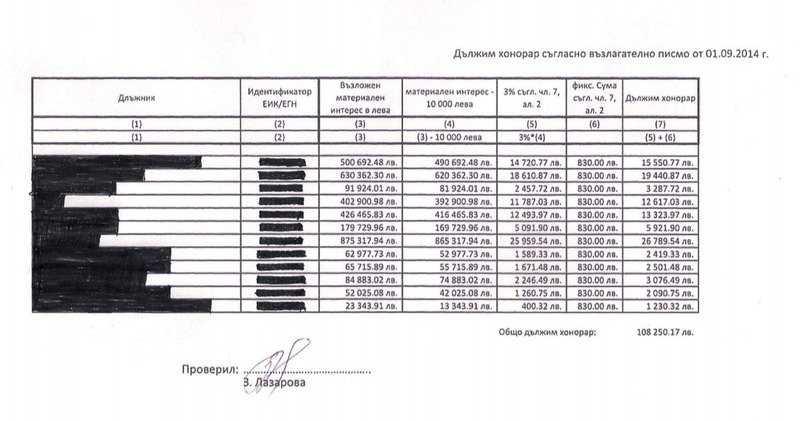 The law firm, selected by the conservators, gets hefty fees from CB “Victoria”, according to documents, which Bivol has. For the period from June 25 to September 23, 2014, “BulLawyers” Ltd. and the law firm “Atanasov” have received 161,148.55 levs from CB “Victoria”, while the quantity and quality of their services is quite doubtful. Documents reveal that “BulLawyers” Ltd. has virtually no other customers. For example, the company has invoiced 16 898.38 levs, with invoice № 337 from August 4,2014, while a month later invoice № 338 from September 3, 2014 is also for about 18,000 levs. It turns out that in the course of one month this company has not issued any other invoice. The most striking, however, is invoice № 1 from September 23, 2014, issued by Biser Atanasov, who is a partner in “BulLawyers” Ltd., but has established a separate law firm under his name “Atanasov” to avoid paying Value Added Tax (VAT). He has given himself a remuneration amounting to 108,250.17 levs. For the period from the beginning of the special supervision of CB “Victoria” until September 23, 2014, “BulLawyers” Ltd. and law firm “Atanasov” have received 161,148.55 levs. Another shocking fact is that the legal consultants of conservator Bozhidar Arshinkov – Biser Atanasov and Rumen Dimitrov – have full access to all credit records in CB “Victoria”. On the basis of an order, issued by the conservators, they are given the opportunity to dig in the loan portfolio undisturbed, including in the so-called non-performing loans and retrieve information constituting bank and / or trade secrets, as well as data on borrowers, the size of their loans and collaterals. As a result, Biser Atanasov has chosen some of the largest non-performing loans (the amount of attorney fees is calculated on the base of material interest), for which the bank has already issued orders for immediate execution and writs of execution, and has, himself, drawn an authorization letter, which has been approved by the conservators. Based on it, he has generated several enforcement cases. For those services he has received 108,250.17 levs, as evidenced by the invoices. These amounts are clearly unreasonable and hurting the bank and the depositors. To initiate an enforcement action, a signed application form shall be filed with the relevant law enforcement officer, which does not represent any legal and / or factual complexity and even does not require a legal degree. Commercial Bank “Victoria” Jsc (formerly “Crédit Agricole Bulgaria” Jsc), which recently has been inevitably linked with “Corporate Commercial Bank” (KTB)as its subsidiary, has actually been acquired by KTB, with the approval of the Bulgarian National Bank (BNB – the central bank – editor’s note) on June 12, 2014 , i.e. one day before the attacks on KTB and its run, and practically ten days before it was placed under special supervision by BNB on June 22, 2014 The acquisition was approved by the Head of the BNB Banking Supervision, Tsvetan Gunev, who is currently facing legal charges. – We confirm the placement of KTB under special supervision, as well as implementation of that measure for its subsidiary. Twenty days later, Crédit Agricole was presented again by BNB as a “well-managed bank with good banking practices”. “The state of its loan portfolio is very good; its securitization and the necessary supplies are good enough,” is written in the press release from July 11, 2014. The truth is that before the crisis with KTB, “Crédit Agricole” has had no problems with liquidity or capital adequacy. In the eight days during which it was de facto owned by the not-yet-running KTB, no employees of the “bad apple” have been there; there have been no transfers to businesses related to KTB majority shareholder Tsvetan Vasilev, and no loans have been granted to them. Liquidity problems of “Crédit Agricole Bulgaria” arose due to cash withdrawals and money transfers in large amounts due to the emerging mass panic among the depositors of the bank as result of the placement of “Corporate Commercial Bank” under special supervision. Until then and at that point, there were no appointed representatives of the new shareholder in “Crédit Agricole Bulgaria” (currently CB “Victoria”). On June 25, the conservators, appointed at KTB and “CB Victoria”, were replaced. Stanislav Georgiev Lyutov and Elena Zdravkova Kostadinchev went to KTB, while Hristina Ivanova Stamova and Bozhidar Ivanov Arshinkov went to Crédit Agricole. The move was officially justified with the amount of work in both banks. According to unofficial information of Bivol, the change of conservators was due to conflict of interest of Slaviyana Danailova – the first appointed conservator in KTB, who was in charge of this bank and could not be moved to its subsidiary for the same reasons. In recent days, a protest letter of employees of CB “Victoria” to BNB lifted the curtain over the actions of the conservators. It became clear that the bank’s loans are being sold; unfounded dismissals are being executed, and conservators are using consultants with questionable competence. Employees of the bank demanded a change of conservators and even declared themselves ready to stage a protest rally.